Traveling often means eating foods that are outside of your normal routine, which can be a fun part of any cultural experience. Yet it can also pose a very real challenge when trying to stay healthy. If you're not paying attention, it can be easy to lose track of what you're eating and how much you're eating. But staying healthy in a foreign place doesn't have to be complicated. 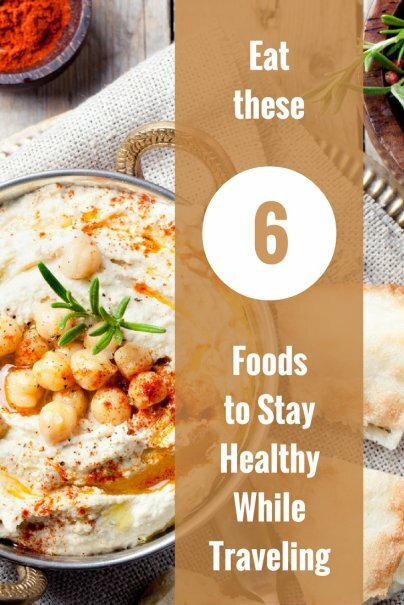 Here are six foods (and a drink) you can usually find that will help you stay energized and healthy even when you're away from home. Eating foods that are fresh and locally grown can go a long way toward keeping you healthy on the road. Anything that hasn't been processed and changed from its original form shouldn't have a lot of empty calories or bad-for-you ingredients. Experiment with exotic fruits and vegetables that you can't find back home. It might not be what you're used to, but local fruits and veggies will give you the fiber and vitamins your body needs to function properly. Chia seeds are one of those trendy superfoods you've surely been hearing about. It's a species of flowering plant in the mint family native to Mexico. Historically, it was a staple of the Mayan and Aztec diets. You can find chia seeds throughout South America. Chia seeds are low calorie, but packed with energy, protein, and antioxidants. Plus, chia seeds are full of fiber to help you feel full for longer and aid digestion when you're trying lots of new foods. There is a wide variety of grains that are extremely beneficial to your health. Look for whole grains when you choose your bread or pasta. Quinoa is full of fiber and protein. Tabbouleh is very common in the Middle East. You may also find couscous, oats, or amaranth, depending on where you go. Chickpeas are relatively easy to find when you're traveling, all across the western world — in India, Africa, throughout the Middle East, and South America. They are very rich in fiber and especially delicious when whipped into a rich hummus dip that you can eat as a dip for vegetables, chips, or as an accompaniment to a salad. Rice is an excellent carbohydrate that you can find in many parts of the world. But that's not the only reason it makes this list. Varieties of rice like wild rice and brown rice are complex carbohydrates, which helps you feel full longer. Rice and beans is a very affordable meal that you'll find in many parts of the world and that's because together, these two form a complete protein. Okay, so maybe it doesn't technically qualify as a "food" per se, but drinking water during your travels is arguably the single most important thing you can do to keep your body healthy and your mind clear. Dehydration is the cause of many of the most common problems that travelers face, like fatigue and headaches. Keeping your body hydrated will do wonders for your health. It can help you aid digestion and keep you feeling energized. Pay attention to how much water you are drinking every day and bring a reusable water bottle on your trip so you can always have water with you. By giving your body a balanced mix of healthy foods and plenty of water, you can help ensure that you are feeling good wherever your travels may take you.